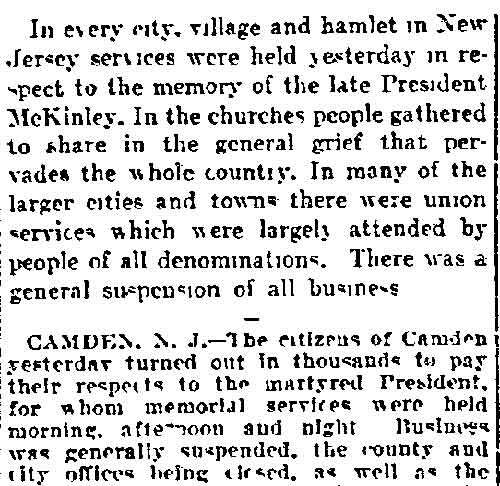 This is another in a series of pages about some of the Jewish families that lived and thrived in Camden beginning around 1880. So many of these families had multiple members who were notably involved in different aspects of life in the city, and over time I have found that many of these families were related either through marriage or business dealings. Father Simon Auerbach was in the dry goods business, at 291 Kaighn Avenue, where he lived with wife Hannah and daughter Fannie at the time of the 1900 Census, He passed away in 1917. 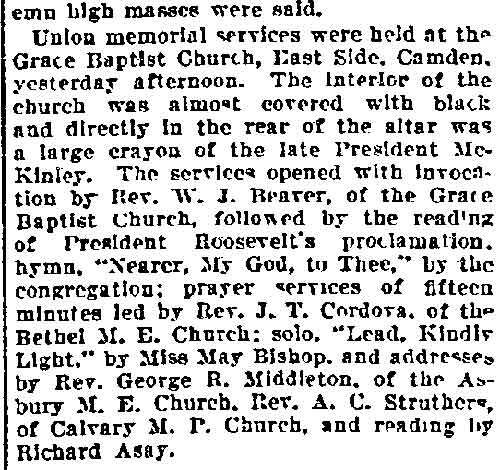 Philip Auerbach and his wife Clara were in Camden by 1896 when son Myer was born. The family, which included wife Clara and younger son Lazarus was living at 303 Kaighn Avenue, where Philip Auerbach operated a men's clothing store when the Census was taken in 1900. This property later became a bar and liquor store known as the Three-o-Three Bar for many years. The Auerbach family retained an interest in this property into the 1930s. They appear to have been involved in 305 Kaighn Avenue by 1897. 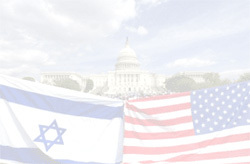 In February of that year Philip Auerbach was elected secretary of the United Hebrew Republican Club. 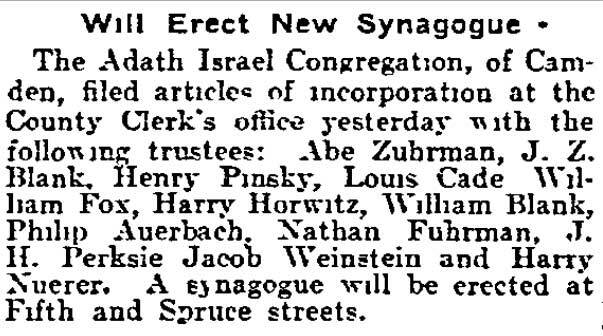 By 1910 Philip Auerbach became a licensed real estate broker, licensed insurance broker, and notary public. He also rented out property. The census states that his home was at 305 Kaighn Avenue and it appears that 303 was his office. 307 Kaighn was H.B. Christman's Saloon, this was later purchased by Martin A. McNulty. 309 Kaighn Avenue was J. Levin's clothing store, and older brother Frank Auerbach was lived at and owned a shoe store at 311 Kaighn. Also worth noting is that a young widow named Fannie Silverman had moved into 299-1/2 Kaighn in the years between the two censuses. Oldest brother Frank Auerbach was living at 1137 South 2nd Street at the time of the 1900 census. He had come to America in 1884 with wife Katie and children Annie, Morris, and Fannie in 1884. Two children were born in New Jersey, two sons, Myer "Mike" and Samuel. In 1900 Frank Auerbach was in the dry goods business. He later owned a shoe store on Broadway in Camden which eventually was taken over by youngest son Sam (and Sam's wife, Sadie). By 1910, Frank's daughter Anna, had married Louis Blumstein. They had a dress shop at 315 Kaighn Avenue. Philip Auerbach later owned the two adjacent stores there, one of which became Robbins shoe store. Frank, Katie, and Sam Auerbach were still at 313 Kaighn in January of 1920. Frank's daughter Fannie married Isadore Mazer. Sadly, Mike Auerbach died in 1922. Three other sons, Jacob, Charles, and Sidney, had all died as children before 1897. 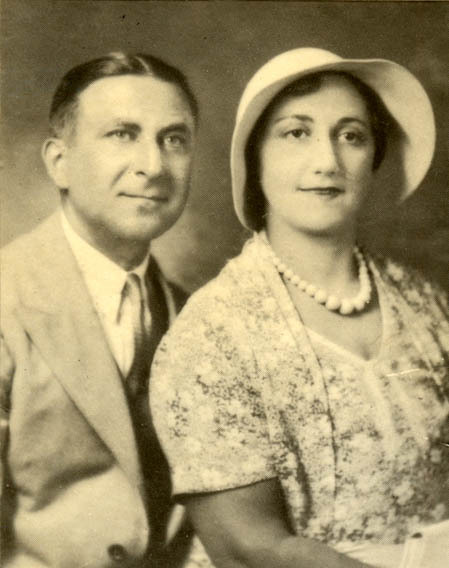 Sister Fannie was married to Isadore Greenberg. 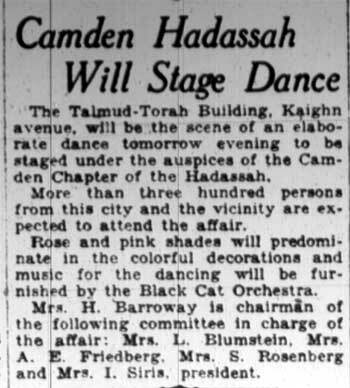 The Greenbergs had come to Camden after the birth of their daughter Ida in Pennsylvania around 1904. They lived at 318 Sycamore Street with her widowed mother Hannah at the time of the 1920 Census. They later moved to South 5th and Walnut Streets in Camden. The house was owned by Philip Auerbach. Benjamin Auerbach brought his family to Camden from Pennsylvania in the mid-1890s. He and wife Sarah were living at 291 Kaighn Avenue when the Census was enumerated in 1910. He was operating a shoe store there. The family had seven children, five of whom were alive at the time, Frank, Charles, Abraham, and Lena were then living at home. A second Samuel Auerbach was living in Camden, at 286 Sycamore Street, around the corner, in 1917. This may be the other child of Benjamin and Sarah Auerbach. 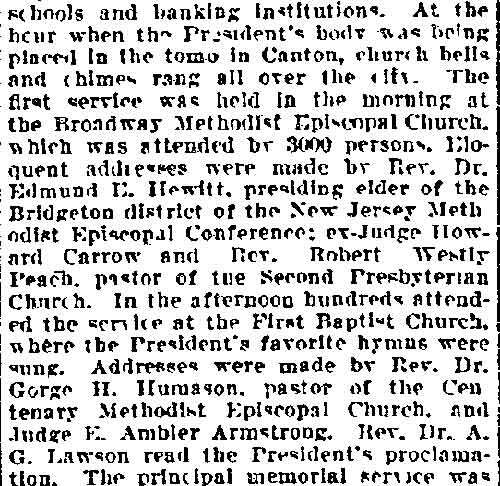 This Samuel Auerbach and his wife Sarah "Sadie" Auerbach and their their sons, Melvin, Edward, and Herbert were still at that address in January of 1920. Sam Auerbach had gone into business for himself as a "music dealer". This family would move to 519 South 6th Street by April of 1930. Samuel Auerbach was then working at Campbell Soup. Benjamin and Sarah Auerbach had moved back to Philadelphia by 1930. Charles Auerbach and his wife Sarah came to Camden from Pennsylvania around 1895, after the birth of their third daughter. It was a large family, eight girls and one boy by 1910. The 1910 Census shows the family living at 283 Walnut Streets, the corner of South 3rd and Walnut. Charles Auerbach was then working as a laborer at the County Courthouse, a job most likely secured him by his brother Philip. The three oldest daughter, Henrietta, 20, Bessie, 18, and Rosa, 16 had already joined the workforce. The other children, son Meyer and daughters Freddie, Fannie, Theresa, Isabella, and Flora were in school or at home. 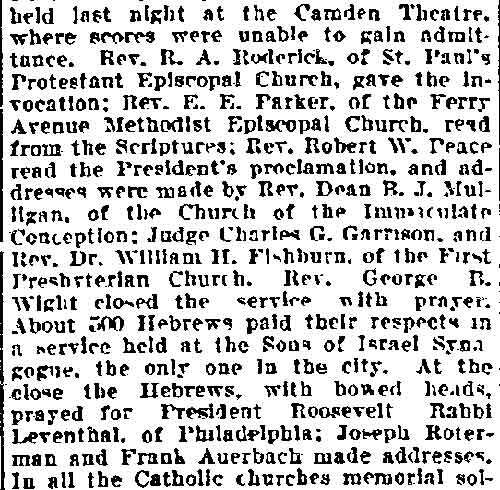 Charles Auerbach was still working for Camden County in January of 1920. By then he had moved his family to 428 Carteret Street. The family was still on Carteret Street when the 1930 Censes was enumerated. Meyer Auerbach changed his name to Mair and graduated from South Jersey Law School in Camden in 1930. He would remain in the city and practice law. By the time the 1930 Census was taken, Philip Auerbach had left Kaighn Avenue for Parkside, his business however, remained on Kaighn. He lived at 1464 Wildwood Avenue with his second wife, Rose. Five children were at home, Carl, 23, a lawyer, Muriel, 19, Isaac, 8, Etta, 6, and Tobey Ann who was then 3. 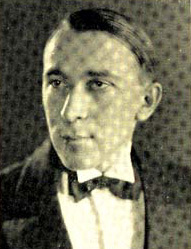 Philip Auerbach passed away in 1936. Carl Auerbach had gone to Camden High School. When the Jewish student fraternity Sigma Alpha Rho founded its Epsilon chapter at Camden High, on October 12, 1923, the first Sacred Ruler of the Epsilon Chapter was Carl Auerbach. Among those who succeeded him were Norman Heine, George Tartar, Samuel Cohen, and Sylvan Grass. 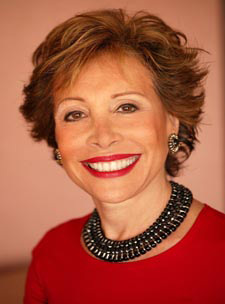 Carl Auerbach's daughter, Carole Saline, like her father a Camden High graduate, is a journalist and best-selling author. Isaac L. Auerbach graduated from Drexel in 1943 and received an MS from Harvard 1947. He had a long and distinguished career in computer sciences, with Sperry Rand, the Burroughs Corporation, and after 1957, his own company, Auerbach Associates, Inc. In 1960 he helped found the International Federation for Information Processing (IFIP), and was its first president, from 1960-1965, and was active in other computer societies, especially the American Federation of Information Processing Societies (AFIPS), where he worked on the History of Computing Committee (HOCC). Frank Auerbach's son Samuel had married. 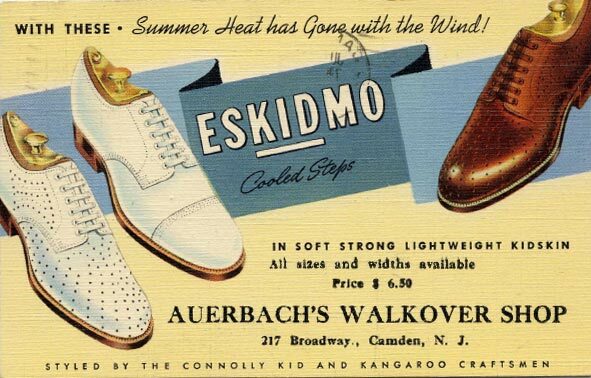 He and his wife Sadie made their home and ran the family shoe business, Auerbach's Walkover Shop, at 219 Broadway. They had moved to 217 Broadway by 1947. 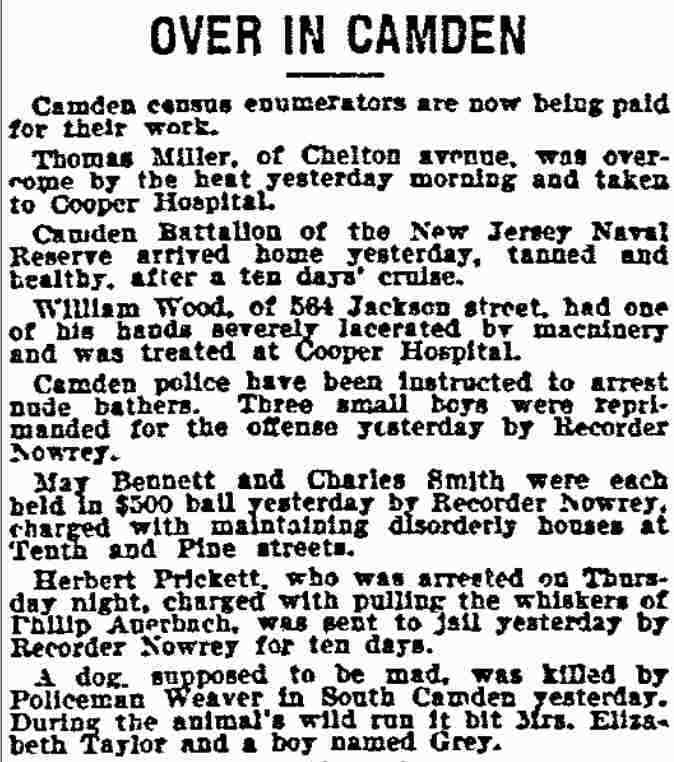 By 1947 besides Sam and Sadie Auerbach there were just a two families carrying the Auerbach surname remaining in Camden. Mair Auerbach and his sister Yetta shared an apartment on Bradley Avenue in Parkside. Edward Auerbach still lived at 519 South 6th Street, his father having moved back to Philadelphia. Carl Auerbach had moved to East Camden, where he made his home at 294 Rand Street. He was practicing law at 116 North 7th Street in downtown Camden. Carl Auerbach also had partnered with Dominick Isolda in a business called Harmony House, at 2405 Federal Street, in East Camden. This business dealt in "Record Players and Combinations, Musical Instruments, and Sheet Music". Carl Auerbach would remain on Rand Street through 1956, but had mioved to Haddon Township by 1959. By 1947 Mair Auerbach and his sister Yetta Auerbach shared a second floor apartment at 1530 Bradley Avenue in Parkside. He was practicing law. The youngest daughter of Charles and Sarah Auerbach, Flora Auerbach, was introduced by her brother Mair to her future husband, East Camden merchant Tanfield Kotlikoff, who with his brothers Harold and Albert (Mitch) operated the famous Kotlikoff's store on Federal Street at 25th Street for many years. 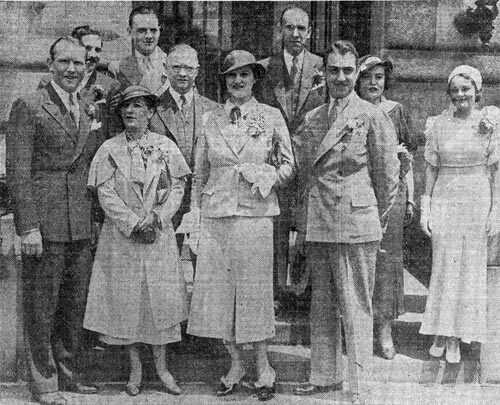 Flora and Tanfield Kotlikoff were founding members of the Temple Emanuel synagogue. Fannie Auerbach, the daughter of Frank and Katie Auerbach, married Isadore Mazer. They were in the bar business. They had the Arcadia Cafe at 201 Federal Street in the mid-1930s, and by 1947 Mazer's Brass Rail Tavern at 20 Market Street, close to the ferry, Campbell Soup, RCA Victor, and the Esterbrook Pen factory. Mazer's Brass Rail was in business late as 1959. By 1947 their son Marvin had also gone into the tavern business. He was running the Berkley Bar at 451 Berkley Street, and appears to have been at that establishment through 1964. Defeated in a previous quest Joseph A. Brassill, of 522 Powell Street, Gloucester, has learned the reward of perseverance. Today he is the happy possessor of the $5 cash prize offered in the daily rhyme contest in the Courier-Post classified ad section. Brasill tells how a discarded chair, destined to destruction was converted into cash through a classified ad. He chose a few lines inserted by the Federal Used Furniture Store, 406 Federal Street, as the foundation for his poetic effort. Why not dispose of it. Mother?" said Mae? "Alright," replied mother, "your suggestion is good. 'The oak in the rocker will make fine fire­wood,"
In the classified section found a home for the chair. Read Courier-Post ads- you'll find it will pay. Nearest to the winning rhyme from among hundreds of others submitted is a Halloween reminder written by Anna Lebengood, of 301 South Washington Avenue, Moorestown. She penned four lines after reading an ad offering masquerade suits to hire by Phillip Auerbach, 303 Kaighn Avenue, Camden. No one to greet me when I come home. In fact my favorite is playing this game. Close my eyes, point, then see what I have. Had a teasing description of a little pup. That I found in the classified ad fifty-nine. "Rhyme writing" seems to have taken a firm grip on South Jersey residents, if the increased number of entrants in the Courier-Post contest may be taken as a criterion, With the growing numbers being received each day there also has been noticed remarkable improvement in meter and tone of the rhymes. Benjamin and Sarah Auerbach are my great-grandparents. I am named for him. I am Norman Auerbach's son and Sydney is my uncle. He died last year. Norman died in 2007. My part of the Auerbach family was pretty much disconnected. I, however, did know Frank, Charles and Pearl, my grandfather Albert's siblings. They were not very close. Albert did have a shoe store in Philadelphia so I guess he kept up the family tradition. for all of their help in creating this web page.